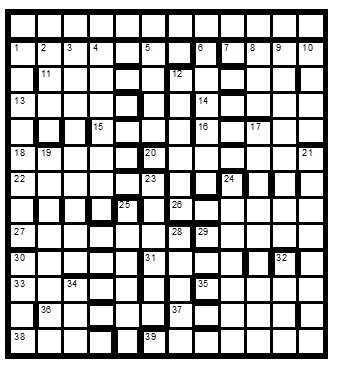 One letter from the answer to a down clue in each column must go up to the top of the column. In clues to all other answers starting with the last down, a letter must go up from one clue to the next clue that doesn’t lead to an affected answer (a letter going 'up' from the first down clue to the last across clue). The letters always affect words in the wordplay part of the clue; those going up and those coming up within a clue never affecting the same word. These 29 letters give an instruction which must be followed. In clues, amendments leave real words, but mostly ruin any surface sense. In answers, rising letters mostly leave non-words in the grid. Entry lengths are shown. The Chambers Dictionary 13th edition is recommended. To enter this competition, send your entry as an image or in list format giving the top row, to ccpuzzles@talktalk.net before the 8th July 2016.The first correct entry drawn from the hat will receive a book from the Chambers range which has been donated by Chambers.